Lamentation begins with the destruction of a city called Windwir. Windwir was a great center of learning, the home of the Andofrancine Order and their library. Scholes notes that Windwir was the “home of many wonders both scientific and magickal.” This destruction is the catalyst for everything to come in the novel, and ultimately everything to come in this series. Ken Scholes introduces a number of characters in the first chapter, all of whom will be quite important in very different ways. Rudolfo, Lord of the Ninefold Forest Houses, is the first character the reader meets and through his eyes the reader sees the distant destruction of Windwir. He, and his Gypsy Scouts, rides to the aid of Windwir knowing that the city was gone, and that “the world had changed”. Then, Petronus – an old fisherman noting that he has lived a lie for more than thirty years. Jin Li Tam, the consort to Sethbert, the Overseer claiming responsibility for the destruction of Windwir. A boy named Neb, far enough to survive but near enough to see the destruction first hand. These are to by the primary characters of Lamentation, the vehicles through which Ken Scholes will deliver the story of his debut novel. It is, perhaps, impossible to overstate the impact and importance of Windwir’s destruction. It is central to the narrative of Lamentation, but it also looms large in the mind of perhaps every character in the novel. It would be akin, I think, to the destruction of the Vatican (moreso if the Vatican also housed the bulk of the scientific and historical knowledge of the world). That’s how important Windwir’s destruction was. The world of Lamentation is a very old one. It has undergone great upheavals to its civilization, and before the destruction of Windwir, the world was slowly building back up. The loss of the great libraries and guidance of Windwir threatens to push the world back into a dark age. What is most interesting about the understated touches on the history of this land is that this is a world where magic and technology both exist, and once flourished. While there is no reason, exactly, to believe that this land was once our own, there is plenty of reason to suspect that its technology once equaled that of our world. There is the occasional mention that the Androfrancine order helped recover some of the lost knowledge and only doled out that new technology and information when the order deemed the world was ready for it. Controlled technological growth. Something to kill for. This is all background, of course. The opening chords played by Ken Scholes. What happens next is continuing political maneuvering on both sides, a giant clash of armies and ideologies, and a series of crosses and doublecrosses. There is much here to like, and wherever a reader thinks Scholes is going with the novel, Lamentation will probably take a different path. Things are not 100% as they initially seem, which is perhaps a lesson to understand about Lamentation as a whole. 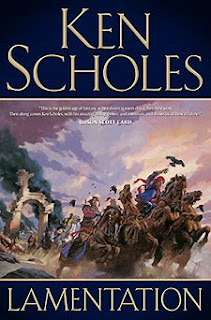 There are complications to everything, and Scholes is quite willing to change the nature of the game on his readers several times throughout the novel. With such a smooth writing style, Scholes is able to keep Lamentation moving along at a brisk pace all the while building a deep richness the world and the political structures. Lamentation is an impressive work of fiction. One point to quibble in Lamentation is the role of women in the novel. The only woman of any prominence (and possibly the only woman in the novel, period) is Jin Li Tam. Jin is a central character to the novel, a scion of the wealthy and powerful Li Tam family, but also a courtesan. That’s right, the only notable female character in the first half of the novel is a high class prostitute. Because of her family situation there is a little more to it than that, but her worth in the novel is in how she relates to men and how she can be used as a tool to build alliance. Oh, Jin is a skillful, intelligent, strong willed woman, there is no doubt. It can also be suggested that in such a semi-feudal and low tech society that Jin’s social position is comparable to that of what a woman could achieve in a similar era. I didn’t notice this until halfway through Lamentation, and then only when Ji Li Tam is given instruction to get herself pregnant. Really? This mars an otherwise excellent novel, and can be considered a minor frustration in the overall reading of the novel, but it is a point worth recognizing. The follow up thought to Jin Li Tam is that midway through the novel a second female character is introduced who presents a significantly different portrayal of what a female can be in this setting. For the sake not of not spoiling aspects of the novel, I’m going to leave out discussing that character at any length, but this, at least, is a welcome change to the initial impression of women in Lamentation. Even so, with only two women of note, the portrayal of women is disappointing. One other thing that bugs me, and this is picking nits, is that one of the historical dark wizards can reasonably be named Wizard XYZ. Seriously. Wizard Xum Y’Zir. I’m all for trying to come up with a good name that isn’t “The Wizard Jeff”, but Wizard XYZ is something that I just can’t get past. Naming is one of my minor issues, as much because I think Rudolfo is a ridiculous name (no offense to anybody actually named Rudolfo), and every time this major character is on the page I’m pulled slightly out of the narrative. Sethbert is also a silly name, but it works because Sethbert is a villain here. That’s enough with the negative. There is more than enough positive to go around and enough to make those brief negatives to be worth overlooking. The history, richness of world building without stalling the story, the political upheaval, heartbreak, characters to care about, and a fair amount of twists to the reader’s expectations is all just a part of what makes Lamentation such a strong debut. It is not perfect, but Lamentation is well worth experiencing. It offers a somewhat fresh take on epic fantasy and does not follow all of the well-worn paths. I don’t wish to overstate Lamentation as being the best thing since sliced bread (let’s face it, sliced bread is pretty darn awesome), but if you like traditional / epic fantasy, you should read this. Ken Scholes is doing something a little different and he’s off to a fine start. I enjoyed this novel as well but you're right; it is male-centric. I didn't notice because I'm somewhat used to that in fantasy novels. I guess that's one thing that urban fantasy brings to the genre, because most (not all by any means) are female-centric. A point worth musing. Great review. I wonder if it as much a symptom of male authors vs female authors and less epic fantasy vs urban fantasy. I don't want to make a sweeping generalization because I'm sure we can each come up with a half dozen quick examples on both sides of the argument. I also wonder what Scholes will do with the rest of the series. I liked your review beside your two main negative points. Forme it doesn't matter whether a book is male-centric or female-centric as long as the story is well done. Naming of characters is always a question of like and dislike. When I read I book I abbreviate names or spell them as I like. Depends on how tongue breaking they are. This isn't the first review of LAMENTATION I read. Anyway I like books with political intrigues and I also don't mind a slow start as long as it is not in a stand alone novel. I will get my copy in September and I really look forward to read it.